There is much more to talk about. We don't have the time to write more until after Dayton. We haven't discussed the Transport level, which is the level that generates/breaks down the datagrams at the Internet level. Dave Borden is out of the country for a few weeks, but we wen t over this prior to his departure. We also had an opportunity, at the Trenton Computer Festival last weekend, to discuss much of this with Steve Robinson but mainly in the context of the East Coast terrestrial network. We think that Steve's thinking and ours are very close and that we can resolve the remaining differences and misgivings at our next meeting with him. For some time now, I have realized that my unique system for packet controlling allows me the option of having a remote terminal controlling my software. The hardware and software for the TRS-80 packet terminal node does not use the available serial port on the TRS-80, making it available for connection to a remote terminal or modem. This past weekend I demonstrated this capability. 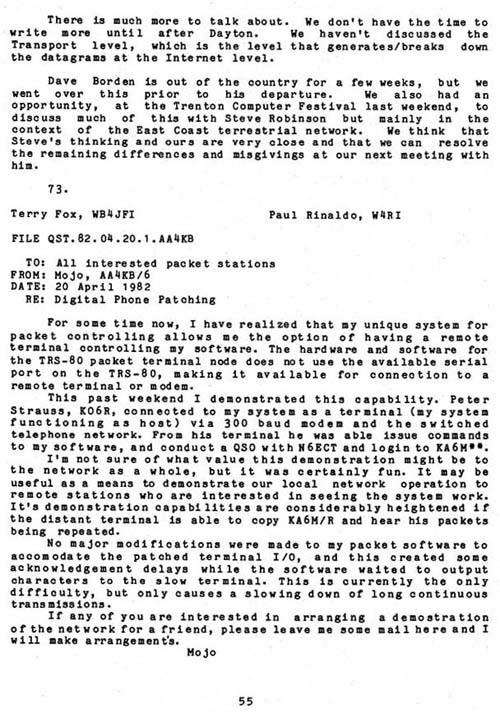 Peter Strauss, K06R, connected to my system as a terminal (my system functioning as host) via 300 baud modem and the switched telephone network. From his terminal he was able issue commands to my software, and conduct a QSO with N6ECT and login to KA6M**. I'm not sure of what value this demonstration might be to the network as a whole, but it was certainly fun. It may be useful as a means to demonstrate our local network operation to remote stations who are interested in seeing the system work. It's demonstration capabilities are considerably heightened if the distant terminal is able to copy KA6M/R and hear his packets being repeated. No major modifications were made to my packet software to accommodate the patched terminal 1/0, and this created some acknowledgement delays while the software waited to output characters to the slow terminal. This is currently the only difficulty, but only causes a slowing down of long continuous transmissions. If any of you are interested in arranging a demonstration of the network for a friend, please leave me some mail here and I will make arrangements.